Home ... The Arc Blog ... All Posts ... News ... Happy 40th Birthday Section 504! Happy 40th Birthday Section 504! As with any law, regulations needed to be written to define who a person with a disability was and what constituted discrimination. There was much controversy surrounding Section 504 and getting the regulations published was a battle that lasted for several years. Disability advocates had to file a lawsuit to get the government to finalize the regulations. Unfortunately, the court did not set a date by which the regulations had to be published. The disability community grew more frustrated. A coalition was formed to lead an effort to get regulations out. 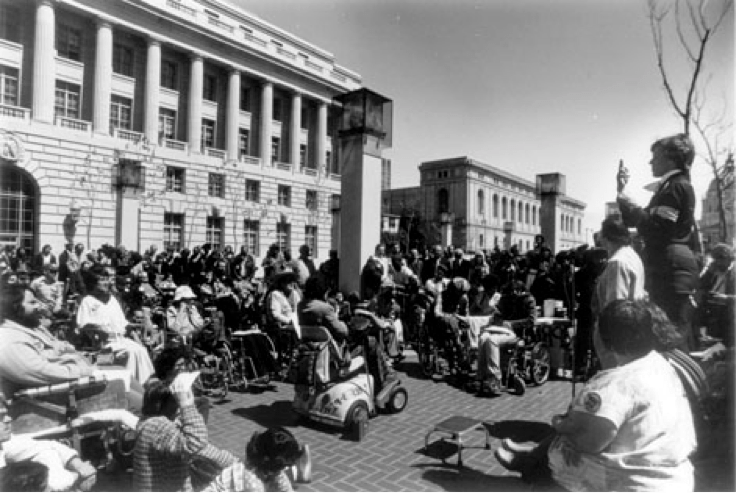 The coalition was called the American Coalition of Citizens with Disabilities. A Congressional hearing was held at the San Francisco HEW office where leaders of the disability rights movement (including Judy Heumann and Ed Roberts) gave compelling testimony about the discrimination each of them faced on a daily basis. A smaller group of disability rights advocates traveled to Washington and demonstrated in front of the HEW Secretary’s home and the church where the President was worshiping. Finally, on April 28, 1977 the Secretary of HEW signed the regulations. Today, every federal agency has Section 504 regulations concerning the programs that receive funds from that particular agency. And today, discrimination is prohibited on the basis of disability in education, employment, state programs, health care facilities, airports, public libraries, public parks, local government buildings and programs; the list goes on and on. This entry was posted in News and tagged Anniversary, civil rights, discrimination, Section 504. Bookmark the permalink.